Waxing with a good quality polish based on beeswax (not spray polishes) brings out the colour and grain of the wood and provides protection. Put a small amount of polish on a soft cloth and rub the piece until the wax on the cloth shines. This will burnish the surface and evaporate any solvent. Then polish with a clean duster. If possible, apply the wax at night to allow it to nourish the wood and polish the following day. If the wood has become very dry, the wax will soak in rapidly and should be applied regularly until a good patina has developed. Normally, wax polish need not be used more than once every few months as too much wax will cause dullness and absorb dust. However, frequent dusting is important, using a clean, dry, soft duster. This will encourage a hard skin to form which enhances the patina. If cleaning is necessary, for example on a dining room table, use a soft damp cloth or clean chamois leather well wrung out. A weak solution of vinegar diluted in water can be used to clean more thoroughly but only on polished, undamaged wood. After cleaning, wipe again with a clean cloth rinsed in clear water and dry immediately with absorbent paper or a soft dry cloth. Spillages and wet rings left by glasses should be dealt with as soon as possible. Always allow areas that have become wet to dry thoroughly, which may take up to a week, before applying clear wax. 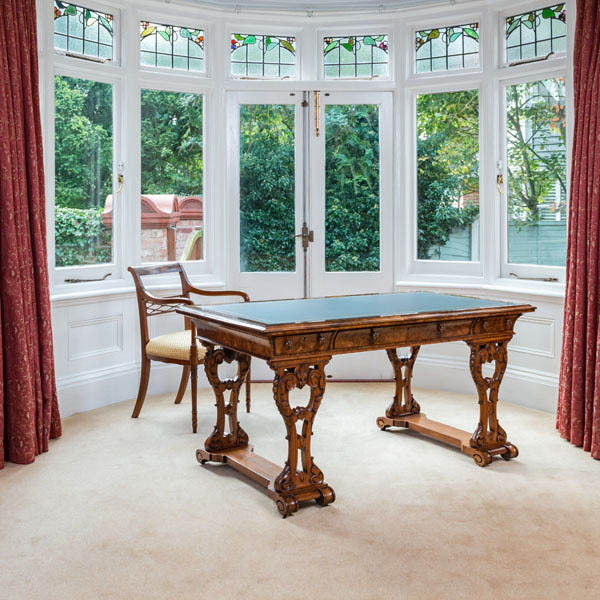 If the wax is applied while the wood is still damp more will be absorbed on the damp patch than the surrounding area and will then darken, leaving the appearance of an ink stain. White rings left by glasses on polished wood can sometimes be removed with a little Brasso applied with a soft cloth. Always work on a small area first in order to be sure the process is not damaging the surface. Candlewax can be lifted off in a slab when cold or can be warmed with a hot-water bottle wrapped in a clean cloth and then removed with a fingernail. 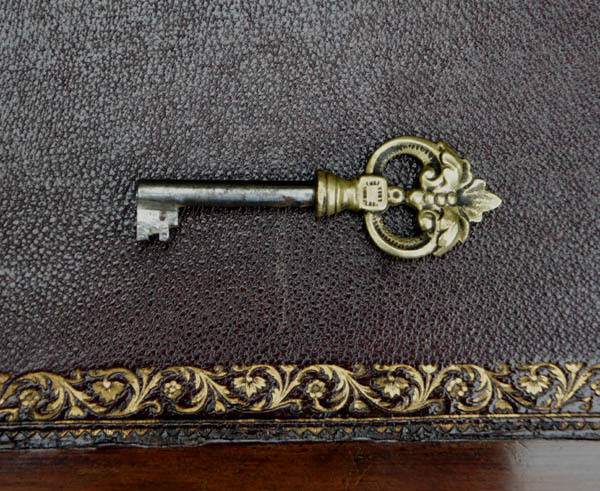 Brass mounts and handles should not be polished with metal cleaners which can harm the wood around them and remove any water gilding. A light burnishing while dusting should be enough to keep them bright. The gold finish on ormolu (gilded bronze) is very delicate and should not be polished. It should be handled as little as possible, as the acid in fingerprints can damage gilding, but it can be dusted gently with a soft brush. If the surface is discoloured, use a swab moistened with methylated spirit and rub gently. Ormolu is the term used to describe gilt brass on decorative art objects from the 18th and 19th centuries, for example gilded mounts on furniture. The gilding was applied using the mercury amalgam process, sometimes also called fire gilding. Copper corrosion products can form on the gold surface through minute gaps in the gilding. Ormolu should be cleaned in the same way as gold. As with silver gilt objects, the gold layer is thin, soft and easily polished away. Small black spots can often be seen on ormolu. These are typically very hard and difficult to remove without damaging the gilding layer. Chemical treatment is needed to remove 'black spot', so consult a conservator. Sunlight and humidity, as well as central heating and pollutants in the air, can affect organic materials like wood, fabric and leather. Therefore it pays to give a little thought to the environment in which furniture is kept and to examine it from time to time to check for damage. Do not keep fine furniture in strong sunlight which will fade its colour. Roller sun blinds cut out rays of the sun without darkening a room, or curtains can be drawn during the day when a room is not in use. 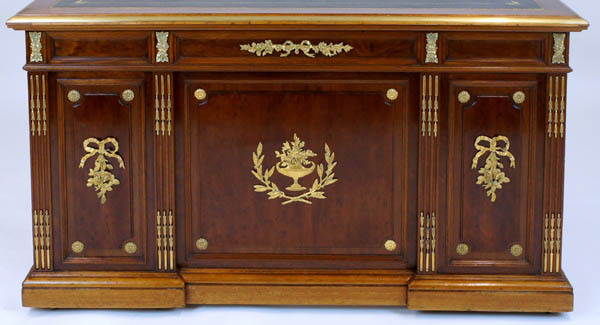 Fluctuations in temperature and humidity can damage furniture, especially inlaid or veneered pieces. Central heating dries the air so the moisture needs replacing. Humidifiers can be readily bought, ranging from simple devices that clip on radiators to sophisticated electric models. Even placing a bowl of water near the furniture can be of help. Damp rooms can also cause problems which can be avoided by using a dehumidifier. The ideal humidity level is around 50 to 55 per cent and this can be checked with humidity indicator cards, strips or a garden hygrometer. The room temperature should be kept as constant as possible, with central heating left on low at night. Rooms should be kept well aired. If, in spite of precautions, furniture starts to warp or split, do catch the problem early and contact a professional restorer immediately. 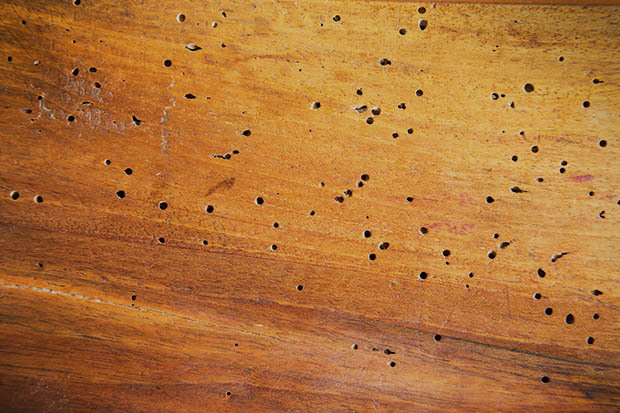 The eggs of the wood beetle are laid in crevices in wood and hatch into larvae (woodworm) which eat into the wood leaving small tunnels before emerging as beetles and flying away, usually during the summer months. The best time to check for freshly bored holes and tell-tail deposits of dust which indicate active infestation. This should be dealt with as soon as possible before the problem spreads. 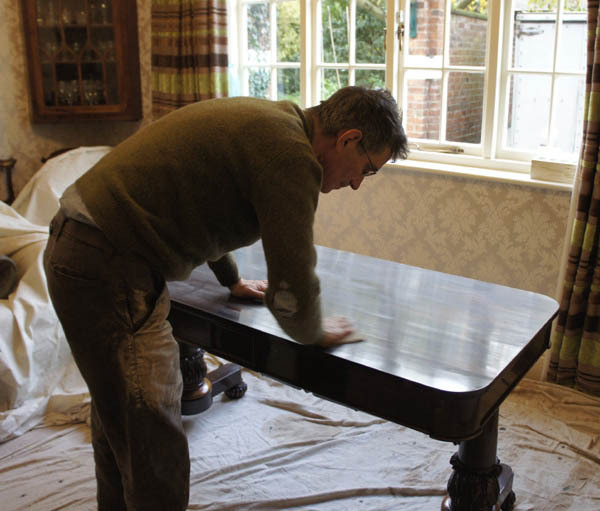 The traditional method of treatment is to apply fluid to kill the eggs on the unfinished surfaces of the wood only as the solvent in the fluid will damage waxed, varnished, lacquered or painted surfaces. A 'low odour' product is as effective as others. After treatment, the worm holes can be filled with soft wax to disguise their presence. There is also a warm air treatment called Thermolignum (www.thermolignum.com) that involves no chemicals or toxins and permanently de-infests any organic material from all animal pests. Other modern treatments for woodworm are available from specialist firms throughout the country.